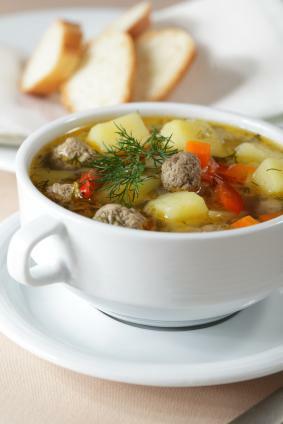 Whether you are looking for a zone-friendly appetizer or a main course, soup is versatile and a great choice for either. The Zone recipes for soup run the gamut of being broth-based to the more creamy textured concoctions. The following recipes will add to your Zone recipes collection for soups. They are sure to satisfy your appetite and keep you on course with the Zone Diet guidelines. In a large saucepan, combine all ingredients, except the macaroni. Bring to a boil over high heat. Reduce heat; simmer for about 30 minutes or until vegetables are tender. 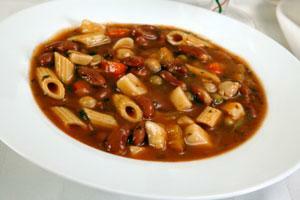 Add cooked macaroni to soup and simmer for an additional 5 minutes before serving. Preheat oven to 375 degrees F. Spray large baking sheet with cooking spray. In a large mixing bowl, combine chicken, diced onion, hot sauce, parsley and ginger root. Blend thoroughly, and form into ½" balls. Place balls on a prepared baking dish and bake for 15 minutes. Place chicken broth in saucepan and bring to boil. Add onion rings, leeks and mushrooms. Reduce heat to medium; simmer until vegetables are tender. Mix cornstarch with a small amount of water until a paste consistency forms. Add to broth; simmer for 5 minutes, stirring constantly until thickened. Remove meatballs from oven and add to the broth. Cook for 2 minutes longer and serve. The Zone Diet is a low carbohydrate diet, but this does not mean you cannot add carbohydrates, such as noodles, rice or a moderate proportion of potato or other starchy vegetable to your Zone soup recipes. Try to use complex carbohydrates, such as whole-wheat pasta in your Zone recipes. One of the most essential guidelines in the Zone Diet is to keep in mind the 1:1 ratio of carbohydrates to protein while preparing any Zone Diet recipe. As long as you adhere to the 1:1 ratio, you can substitute any of the soup recipe ingredients with any number of your own favorites. Zone Diet recipes, including soup recipes, are not complicated, and you will be cooking in the Zone in no time at all.